Use only the membrane manufacturer's approved sealant. Minimum 100 mm (4") flange onto roof membrane. 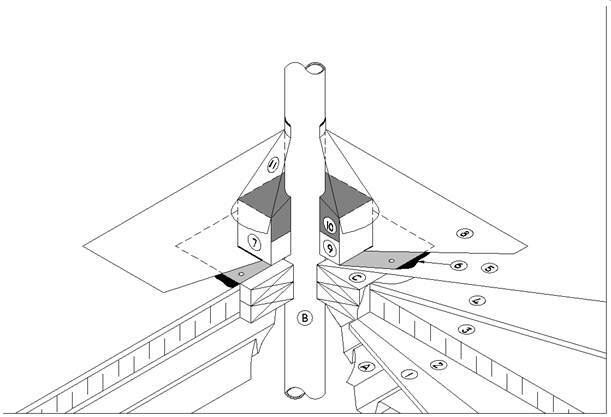 All corners, with the exception of one job-site formed double standing seam corner joint and adjoining lapped flange joining, shall be closed and soldered. Minimum height of gum pan to be 100 mm (4"). Onto primed metal flashing flange. To prevent displacement of compatible mastic. Use only the membrane manufacturers’ approved proprietary polyurethane based structural sealant. To be installed whenever practical. Caulk at top of collar. WARNING: DO NOT USE THIS DETAIL WITH HOT PIPES. AVOID THIS DETAIL: Wherever possible use Flanged Metal Stack Flashing or Curbed Opening (See 11.1.2.2 Curbs and Penetrations).